The space rock that hit Earth 65m years ago and is widely implicated in the end of the dinosaurs was probably a speeding comet, US scientists say. Researchers in New Hampshire suggest the 180km-wide Chicxulub crater in Mexico was carved out by a smaller object than previously thought. Many scientists consider a large and relatively slow moving asteroid to have been the likely culprit. Details were outlined at the 44th Lunar and Planetary Science Conference. But other researchers were more cautious about the results. "The overall aim of our project is to better characterise the impactor that produced the crater in the Yucatan peninsula [in Mexico]," Jason Moore, from Dartmouth College in New Hampshire, told BBC News. The space rock gave rise to a global layer of sediments enriched in the chemical element iridium, in concentrations much higher than naturally occurs; it must have come from outer space. However, in the first part of their work, the team suggests that frequently quoted iridium values are incorrect. Using a comparison with another extraterrestrial element deposited in the impact - osmium - they were able to deduce that the collision deposited less debris than has previously been supposed. The recalculated iridium value suggests a smaller body hit the Earth. So for the second part of their work, the researchers took the new figure and attempted to reconcile it with the known physical properties of the Chicxulub impact. Why do comets get attracted to our planet so often? For this smaller space rock to have produced a 180km-wide crater, it must have been travelling relatively quickly. The team found that a long-period comet fitted the bill much better than other possible candidates. "You'd need an asteroid of about 5km diameter to contribute that much iridium and osmium. But an asteroid that size would not make a 200km-diameter crater," said Dr Moore. "So we said: how do we get something that has enough energy to generate that size of crater, but has much less rocky material? That brings us to comets." Dr Moore's colleague Prof Mukul Sharma, also from Dartmouth College, told BBC News: "You would need some special pleading for an asteroid moving very rapidly - although it is possible. But of the comets and asteroids we have looked at in the skies, the comets are the ones that are moving very rapidly." Long-period comets are balls of dust, rock and ice that are on highly eccentric trajectories around the Sun. They may take hundreds, thousands or in some cases even millions of years to complete one orbit. 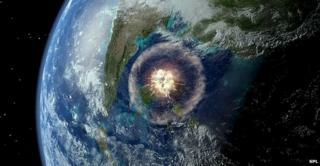 The extinction event 65 million years ago is now widely associated with the space impact at Chicxulub. It killed off about 70% of all species on Earth in just a short period of time, most notably the non-avian dinosaurs. The enormous collision would have triggered fires, earthquakes and huge tsunamis. The dust and gas thrown up into the atmosphere would have depressed global temperatures for several years. Dr Gareth Collins, who researches impact cratering at Imperial College London, described the research by the Dartmouth team as "nice work" and "thought-provoking". But he told BBC News: "I don't think it is possible to accurately determine the impactor size from geochemistry. "Geochemistry tells you - quite accurately - only the mass of meteoritic material that is distributed globally, not the total mass of the impactor. To estimate the latter, one needs to know what fraction of the impactor was distributed globally, as opposed to being ejected to space or landing close to the crater." He added: "The authors suggest that 75% of the impactor mass is distributed globally, and hence arrive at quite a small-sized impactor, but in reality this fraction could be lower than 20%." That could keep the door open for a bigger, more slowly moving asteroid. The authors accept this point, but cite recent studies suggesting mass loss for the Chicxulub impact was between 11% and 25%. In recent years, several space objects have taken astronomers by surprise, serving as a reminder that our cosmic neighbourhood remains a busy place. On 15 February this year, 2012 DA14 - an asteroid as large as an Olympic swimming pool - raced past the Earth at a distance of just 27,700km (17,200mi). It had only been discovered the previous year. And on the same day, a 17m space rock exploded over Russia's Ural mountains with an energy of about 440 kilotonnes of TNT. About 1,000 people were injured as the shockwave blew out windows and rocked buildings. Some 95% of the near-Earth objects larger than 1km have been discovered. However, only about 10% of the 13,000 - 20,000 asteroids above the size of 140m are being tracked. There are probably many more comets than near-Earth asteroids, but Nasa points out they spend almost all of their lifetimes at great distances from the Sun and Earth, so that they contribute only about 10% to the census of larger objects that have struck the Earth.